One hundred years before the premiere of Fox's new timey-wimey TV series, one of the most punishing nature expeditions ever undertaken also went by the name of Terra Nova. The ill-fated Antarctic excursion was led by explorer Robert Falcon Scott, who was determined to lead the first successful adventure to the South Pole. Scott and his party would reach their goal malnourished and exhausted on January 17th, 1912 — but they arrived 33 days after a team led by Norwegian explorer Roald Amundsen, and Scott's entire crew would perish on the return journey. Amundsen's team not only handled the expedition with greater ease, it also emerged from the expedition without the loss of a single human life. Let's examine ten of the deadliest mistakes made by Scott and his crew on this, the real-life Terra Nova Expedition. In my mind no journey ever made with dogs can approach the height of that fine conception which is realised when a party of men go forth to face hardships, dangers, and difficulties with their own unaided efforts, and by days and weeks of hard physical labour succeed in solving some problem of the great unknown. Surely in this case the conquest is more nobly and splendidly won. Needless to say, Scott did not utilize dogs in his expedition to the extent that he almost certainly should have. Amundsen, by comparison, relied entirely on sledge dogs. Yes, ponies. Scott was of the mind that ponies had served his fellow explorer, Ernest Shackleton, particularly well on a previous Antarctic expedition, and that they could be used not only for transporting supplies for the first half of the joinery to the Pole, but as a fresh source of meat. See the machine here? It's a motorized sledge — basically a snowmobile for hauling food and equipment. Sounds like a pretty good idea, right? Scott thought so, too. The only problem was these motorized sledges were pretty much invented for the purposes of the Terra Nova expedition; and experimental equipment comes with experimental failures. Before the expedition could even begin, the first sledge (the heaviest) fell through the ice and sank, irrecoverable, sixty fathoms into the sea. The other two would surrender to the biting Antarctic cold. Nothing could be done about the first, drowned sled, but could mechanical problems with the other two have been avoided? Possibly. But engineer Michael Barne, who designed the sledges, was recently married, and also still recovering from frostbite suffered on a previous Antarctic expedition with Scott. Needless to say he was not exactly keen on setting out on another sub-zero adventure anytime soon. Remember Scott's macho complex that I mentioned earlier? Well, on the Terra Nova expedition, that complex manifested itself in a huge way in the form of something called man-hauling. When Scott was waxing about "unaided efforts" and "hard physical labor" of Antarctic explorers, he was talking about man-hauling — the practice whereby the explorers themselves — unaided by dog, pony, or motorized sledge — do they equipment-schlepping. Unfortunately, failed equipment and perishing ponies meant that Scott and his crew had to do more man-hauling than they'd bargained for, resulting in unanticipated exhaustion. Scott and his fellow exploers climbed the 100-mile-long Beardmore glacier over the month of December, 1911. He started with a sizable crew, but sent men back to base camp in small teams throughout the month. 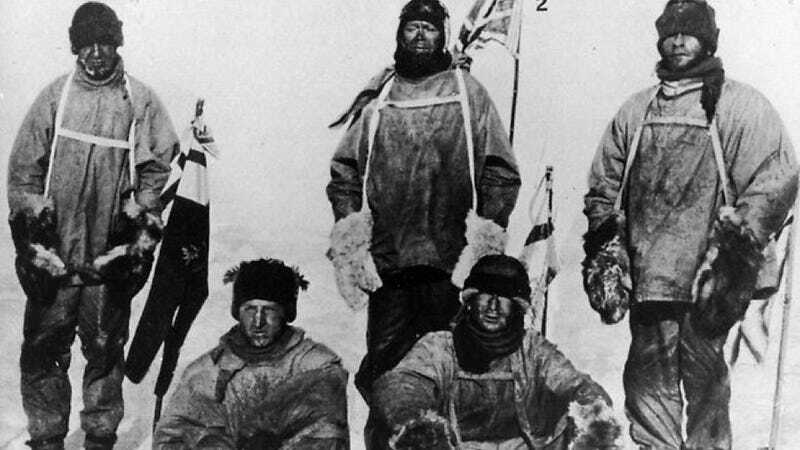 On January 3rd, he selected four of the remaining seven men to continue with him to the Pole. But Scott had only planned on 3 men accompanying him on the final leg of his journey. Feeding five overworked men with food for four left Scott and his team more enervated than ever. Navigating in the bitter conditions required a working understanding of at least one or two popular navigating tools: a lightweight sextant (pictured here) or the comparably heavy theodolite. Amundsen's team not only sided with the more trek-worthy sextant, four members of his five-man team also knew hot to navigate. Scott, on the other hand, chose to bring the burdensome theodolite — a device only one of his crew knew how to use. Amundsen's expedition was about one thing and one thing only: getting to the South Pole and making it back alive. Scott saw the South Pole as more than just a destination; he was determined to introduce a scientific element to his journey by collecting rock samples along the way that could later be examined more closely. Supplementing exploration with rock-collecting wasn't necessarily a bad move in and of itself, but Scott was already overstaffed, underfed, and poorly equipped. Rocks, as you may have guessed, only add unnecessary weight — so it's hard to imagine what could have compelled Scott and his team to continue collecting rock samples even once the team began failing to meet their projected mileage, day after day. When you don't log enough mileage, it takes you longer to reach your destination; more days traveling requires the rationing of food; and food, you'll recall, was already in short supply. Conspicuous landmarks are few and far between in the Antarctic, and weather conditions not only cut back on visibility, they also have a knack for erasing tracks, which can prove useful when finding your way back home from a multi-month trip to the South Pole. Records from both expeditions indicate that Scott was much less vigilant about erecting route markers and establishing supply depots (stores of food and supplies) for his team's return trek. Shown here is Scott's team gathered at the tent and marker left at the South Pole by Amundsen and his crew. Scott brought expert Tryggve Gran on the Terra Nova excursion, in hopes that he might help train the rest of the expedition's crew to ski. By no means, however, was training required. Amundsen, by comparison, had recruited an entire team of experienced skiers, all of whom had trained in the years leading up to the expedition. "Skis are the thing," Scott would lament in a diary entry written during his doomed journey, "and here are my tiresome fellow countrymen too prejudiced to have prepared themselves for the event".